The micro-penetration viscometer is used to directly measure viscosities in the range of 107 to 1011 Pa s in a glassy sample. 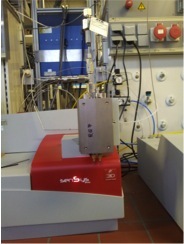 Thereby an Iridium-indenter is penetrated into the sample during an isothermal segment. The viscosity is directly correlated to indentation-depth and can easily be calculated. 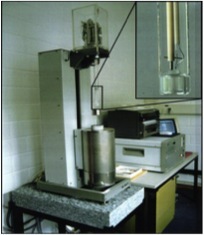 Differential Scanning calorimetry is a frequently used method in geosciences. 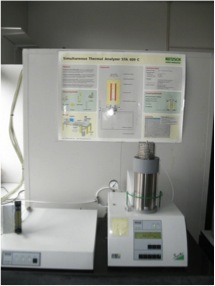 Here, we measure the thermodynamic properties of an unknown sample compared to a reference material as a function of temperature. It is thereby possible to study the thermal history of geomaterials, i.e. volcanic glasses. 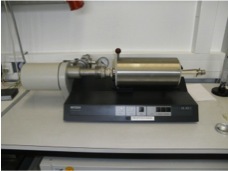 The STA is a combination of a DSC and a thermogravimetric instrument. 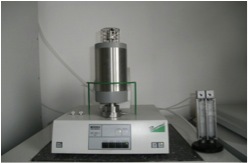 Besides heat capacity measurements one is able to study mass changes of a sample material, as a function of temperature with time, and additionally of pressure and gas composition. Volumetric properties are determined on glassy materials using a push-rod dilatometer in horizontal geometry.This includes for example the measurement of thermal expansion of a material applying a controlled temperature program.